The AAMM module is available as part of the DAPtools Standard software package. All xDAP systems can use the AAMM module, but the xDAP 7420 is recommended for the most demanding applications. The Anti-Alias Multichannel Module (AAMM) provides all-digital filtering that delivers data free of aliasing effects, with superior data quality. Most systems can dispense with hardware anti-aliasing filters. If it seems implausible that digital signal processing technology can work for this, first visit the article All-Digital Anti-Aliasing on this site. That article will briefly review the topic of aliasing, and explain how the digital processing approach works. The traditional solution is to insert anti-alias lowpass filters into your input signal path prior to sampling. This is a good but imperfect solution. Sometimes the distortions you get from the filtering are worse than the damage the aliasing would have caused. The digital approach uses a very high sampling rate, followed by digital filters to reduce the sample rate to one that is more useful and practical, without aliasing. The filtering is custom-configured for exactly the output rate you specify. The AAMM module package installs the AAMFILT processing command into the embedded processing environment of your xDAP system. After this installation, you can configure the anti-alias filtering using a single line of DAPL configuration script. The following is an example. This line can be interpreted as follows. The technical performance of the digital filtering is far beyond anything that analog anti-alias filters can do. Hardware filters typically force you to make the difficult choice between phase distortions that corrupt waveform shapes (Butterworth) or frequency attenuation that damages waveform amplitudes (Bessel). With the digital filtering, you do not need to compromise. Detailed application information is available in the User's Manual for the AAMM module. 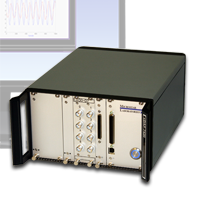 To obtain a copy of the module to use with an xDAP system, contact Microstar Laboratories.